Powerful Sales Solutions launches the 5 Day Superhero Sales Challenge January 18 to help entrepreneurs and business owners get over their growth hurdles, transform their B2B sales process, and double their results in 2018. Businesses should approach sales as an inherently win-win scenario, benefitting all parties involved. 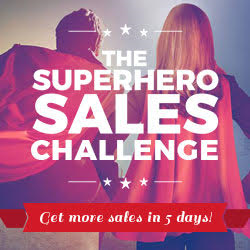 Powerful Sales Solution is launching a 5 Day Superhero Sales Challenge on January 18 and registration is already open! This B2B Sales Challenge is specifically designed for entrepreneurs and business owners who want to transform their B2B sales process, tackle their challenges, take on a new and effective approach, and double their sales results. Daniel Moskowitz, Founder and Lead Mentor at Powerful Sale Solutions, is a sales expert who truly understands the pain points involved in the B2B sales process, and the subtle nuances that can make or break a sale. Now, Daniel is sharing his expertise with the world in the 5 Day Superhero Sales Challenge. In addition to the value-filled 5 Day Challenge, Powerful Sales Solutions is also offering a complimentary Superhero Sales Breakthrough Call with Daniel, a unique opportunity for any entrepreneur or business owner. Daniel has pioneered the Offer To Serve Methodology, and it is an intensely powerful B2B sales tool once implemented, internalized, and executed. Instead of focusing solely on pressure sales, emphasis in placed on the process of nurturing leads, developing authentic relationships based on integrity and trust, truly understanding pain points, business needs and goals, and actually helping. Join Daniel and the Powerful Sales Solutions team for 5 days of intense learning, discussions, and daily call-ins. Get the tools and support needed to transform those dreaded sales call into authentic conversations with the Offer To Serve Methodology, and the results will speak for themselves. Powerful Sales Solutions helps businesses develop and implement a powerful, successful, and sustainable B2B sales process. Daniel Moskowitz is the Chief Mentor and Founder of Powerful Sales Solutions. As a B2B sales expert for over 15 years, in multiple industries and sectors, Daniel is on an epic mission to change the way B2B sales are conducted. With a focus on Daniel’s unique and effective Offer to Serve Methodology, businesses have a positive way to boost sales, develop amazing client relationships, leave a lasting legacy, and grow.